- sights, places of interest : Vorkuta is full of Stalinistic buildings and wide boulevards that to some people probably is terribly ugly. The city is situated in the middle of the six (earlier 12) coal mines in the area. Vorkuta was originally built as a Gulag-concentration camp to where Stalin sent his enemies - a big part of the population at the time. The people that you meet in Vorkuta all have their personal story to tell about those years of horror that really touched me deeply to hear. * museum : in Lenina, opposite number 35, Three small rooms : one room with the history of the area, Vorkuta and the Gulag. The second room tells you about the flora and fauna of the tundra and the third room is dedicated to ethnografical information about the Nentsy and Komi peoples. There are post cards for sale and beautiful photos of the Nentsy and their reindeers. * Gulag : the now passed away father of Georgi Mamulaishvili used to be the head of the organization of the victims of the Gulag and if you contact him he will be happy to put you into contact with the organization where you can get lots of information about the sad past of Vorkuta. (Telephone number to Georgi : 2151-40933). The organization of the victims of the Gulag have rised a monument, a stone on top of a pillar that looks out over a part of the former Gulag, that you can reach by foot. Walk past the Gastinjitse Vorkuta away from the center along the main road, then turn left, the monument stands on the other side of the river. * mines and German cemetary of the Gulag : citybusses 103 and 104 takes you from Rynok market on Lenina to a few of the extreemely ugly mines and factories in the Vorkuta area, 13 Rubel. 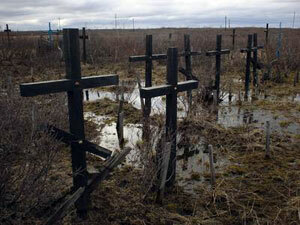 The old cemetary of German and Estonian victims of the Gulag is situated about 15 kilometers from Vorkuta. If you continue with bus 103 or 104 past the mines until about one kilometer before the flat blocks of Joerschor the cemetary is on your right hand side, alone in the middle of the tundra. It is a small place, only a couple of hundred wooden crosses far away from everything but with a kind of sad and melancholic beauty. Ask the bus driver to stop at "Nemetsky Kladbish". * Nentsy reindeer herds : although the biggest part of the Nentsy people stay on the Yamal peninsula near Salekhard there is also some chance of meeting Nentsy people around Vorkuta. The center of the Nentsy people is the village Narjan Mar. Transport in this region is very difficult, the train goes a little bit further north but from there on you have to have your own means of transport. To get to Narjan Mar you can take the train to Irael, from there a bus will take you to Izjma and from there you take the boat to Narjan Mar or the train to Pitchora and from there to Narjan Mar. - climate in North Russia : in the winter the average temperature is -30 with peaks of -45 (the minimum record is -68°C). The summer lasts only two months, from the beginning of July to the end of August. During the summer there are days with a temperature of +25°C (the maximum temperature record is +37°C) but it may as well be only +10°C. June is an in between month, when I arrived in Vorkuta in June the snow had just melted away. The temperature stayed around 0°c and there was still no sign of new leaves coming on the trees. One week later the temperature made an unbelievable rise to +25°c and the summer had started. Depending on the day that King Winter decides to depart June can mean eighter winter or summer in Vorkuta. One bad side of the Vorkuta summer temperature rise is the mosquitos. If you're planning a visit to Vorkuta during the summer do bring mosquito protection, anti mosquito cream, mosquito net etc can also be purchased there. I think the best season to visit Vorkuta in is in the early autumn, in September when the mosquitos are gone and the Tundra is burning with beautiful colours. - reindeer meat : a local speciality that unfortunately is very hard to find in the restaurants.On the contrary you can find it raw in vacumpack in the blue shopping center next to Hotel Vorkuta for 200/300 Rubel per kg; ask for "allein". Near Vorkuta there is supposed to be some kind of big meat factory that sells reindeer meat. - information on the internet : the city of Vorkuta has it's own website : http://www.vorkuta.ru/, use a translation website if you don't understand russian (information about this under general info Russia). Inpolar Tour: Tours of one up to several weeks with tank through the swamps of the arctic Ural and meetings with the Nenets nomads. Also visits to Yamal peninsula. Be prepared for lots of mosquitos in summer. Some of my friends did this trip during summer 2007, watch the pictures of their travel to the Arctic Ural. Polar Travel, Lenina 45, [email protected], organizes quite expensive city visits and tours in the Vorkuta area. During my visit they couldn't say much about their tours since the responsible person was for the moment not there (telephone number 73323). * Hotel Lena : a clean guesthouse where workers stay over with warm showers and clean warm rooms. It has a bit the atmosphere of a "real western" youth hostel, but is still not a bad place. To get to Hotel Lena; go straight out of the station, take a right after the big red building (= second street to the right), the guest house is the second house in the street on the left hand side, the only wooden building in the street but it has no hotel sign.It costs 70 Rubel per night, no registration is possible which means that you can not stay longer than three nights. (Telephone number : 92670). * Hotel Vorkuta : A big Sovjet hotel with rooms for 366/412 Rubel, the room for 412 Rubel has two beds that also can be rented apart for 206 Rubel. They don't exchange Dollar but it's possible nearby (see further down). (Telephone number: 40609). * Hotel Gotyak : more luxurious and expensive than Hotel Vorkuta. - restaurants : Restaurant Shangri La under Hotel Vorkuta turns out to be an unexpectedly nice Georgian style restaurant with all the necessary attributes such as horns hanging on the walls, dark wood etc, but on the menu card not many Georgian disches can be found... It's cheap but the portions are small and not very exciting. Bigger portions can be found in the shashlik tent nearby for the same price. - internet : in the post office (1.2 Rubel/min) or better in the internetcafe in ul. Gogolja 7 (55 Rubel/hour which is new but lies quite hidden under a flatblock. Turn off at Lenina no 45 and search between the flatblocks a little further in the same street as the blue kind of fake castel. - travel by train : Moskow - Vorkuta. From Moskva Jaroslavlskaja there are two trains daily, at 13.27 and 21.42; arrival in Vorkuta 11.57 resp 13.15, two nights later. The distance is 2282km and the price 1200 Rubel for ticket in kupe. There are also trains between Vorkuta and Sochi (see information in the Sochi section). In the Vorkuta trainstation there is a pharmacy and a small shop. Shuttle busses drive between the station and Vorkuta center every 10 minutes for 4 Rubel. By foot to Lenina takes aprox 30 minutes.